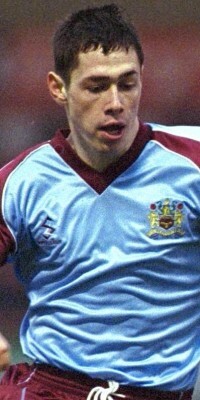 Brad Maylett joined the Clarets in the summer of 1997 on a three year scholarship at the age of sixteen, at a time when Chris Waddle was replacing Adrian Heath as manager. He progressed through the youth and reserve teams during that first season but he was to get a first team call probably sooner than he could have hoped. Stan Ternent had replaced Waddle a year on, and with the side having a difficult time and with players having been discarded the new manager turned to members of his youth squad to bolster the first team. Not many players can boast a debut in a 4-0 away win but Maylett did just that when he replaced Andy Payton in October 1998 at Colchester, albeit with just three minutes remaining on the clock and the scoring having been completed quarter of an hour earlier. Coming on as a sub was a feature of his Burnley career. That debut was one of seventeen league appearances that season and all of them were from the bench. His only start came in an Auto Windscreens tie against Preston. If he thought that start was a stepping stone to a first team place he was to be disappointed in the following season when he didn't feature at all as the Clarets won promotion, but he eventually got his first league start in 2000/01and again it was against Preston, this time a 2-1 defeat at Deepdale. There was to be just one more start in the remainder of that season, and in 2001/02 he was once again restricted to sub appearances. When nothing changed in 2002/03 he went out on loan to Swansea then managed by Brian Flynn, but after just five games for the Swans he was recalled by Ternent who brought him off the bench at Portsmouth only to substitute him after just 45 minutes on the pitch. Ternent was very critical of his performance and after one more appearance, the debacle against Sheffield Wednesday at the end of that season he returned to Swansea on a permanent basis. He had two seasons at Swansea before signing for Boston United on loan in March 2005. Again that led to a permanent move and he played for the Lincolnshire club for the next two years. He was loaned out last season to Chester but returned to play his part in the relegation battle that was lost on the last day of the season at Wrexham. With Boston relegated two divisions he opted to sign for Northwich Victoria in the Blue Square Premiership but he was on the move again in February 2008 when he signed for Leigh RMI. A move to Fleetwood followed before he signed for Witton Albion in March 2009. In June 2010 he completed a move to Welsh Premier League club Rhyl.